Ahead of the Curve: What Are Big Law Recruiters Really Looking For? Welcome to Ahead of the Curve, our new series for incoming 1Ls. We’re getting lots of questions about what law school to attend, how to pay for it, and what people can be doing now to set themselves up for success in law school. Stay tuned, and be sure to sign up for our free mailing list and check out the Start Law School Right course to ensure you’re ready to go on Day One! Whether you are applying to law school, just starting, or are finishing up your first year, you’re probably already thinking about what will come after graduation. Will you be able to make the cut and get that job you’ve heard about in “big law” with the astronomical starting salary? You will probably have student loans to pay back, and a high-paying first attorney position could help you to make those repayments quicker, as well as offer resources and excellent training for a new lawyer. But you may be wondering, what are those recruiters at the big firms looking for? And can you really get one of those coveted positions? As someone who worked as a recruiter in a few of those top firms for over ten years, I have some insight into what they are really looking for in a summer associate or new hire, and I know the common mistakes that will prevent you from even meeting anyone in person. Here’s my best advice to you, if you want a position in a large law firm. I’ve reviewed thousands of resumes and cover letters, and was always shocked at how often there were typos or other errors. I would see these mistakes on resumes from top ten law schools, where students have access to all the best resources and career services help. My top tip is to make sure the materials you submit are in perfect shape. This includes making sure you are addressing it to the correct recruiter, and that their name and the name of the firm is spelled correctly. I had one student submit materials to our former firm name (when we had gone through a merger TWO years before)! 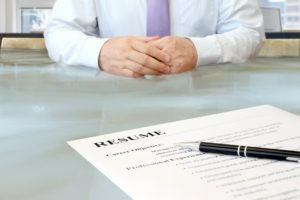 Obviously, big firms are looking for top grades and top law schools, but, even if you fit that profile, you may have something on your resume that needs explaining. Make sure you have that all figured out before you even submit your materials. If there is a gap on your resume, you need to be able to explain that. If you had some lower grades one semester because of an illness or family situation, you need to explain that, too. If you are applying to a firm in a different location than where you’ve ever lived or gone to school, it is key that you can explain why. Firms don’t want to take a big chance on their new hires, so make sure they think you are not a risk. I’ve been in many meetings when we discuss which candidates we want to make an offer to, for summer associate positions as well as for full-time employment, and, often, the candidates all have the same credentials (or close enough). This is where personality and some intangible qualities come into play. Starting with your cover letter, make sure to give a sense of who you are and why you think you are a good fit for that firm. I always recommend having an interest section in your resume. I know that you may think you don’t have a lot of interesting hobbies, but pick anything, even if it seems random (while I didn’t do it that long, I usually refer to my glassblowing hobby because people are interested in it). It gives something for the interviewer to talk to you about in person. I also suggest being specific with interests – it’s better to say you have traveled to 6/7 continents than just that you like to travel. That goes even further when you actually get a call-back interview. These lawyers are often conducting many, many interviews and you want to make sure they remember you. Now that doesn’t mean going overboard and doing anything outrageous (although we remember those students for the wrong reasons), but make sure you show the part of you that you think distinguishes you from all the other law students they are meeting. Don’t ask the typical questions. Prepare a few things that go beyond the usual, “what is it like to work here?” types of questions. The questions you ask will give them insight into what is important to you in a workplace, and show that you took the time to research and think of something creative. Be yourself and, remember, it’s really just a conversation! On-campus interviewing is the time when employers interview rising 2Ls for summer associate positions, and it is really your best shot at starting your career at a big law firm. While most schools have lottery systems for matching up students with employers for interviews, there is always a chance at being added into a schedule or gaining an open spot that you weren’t assigned. The first place you can do this is by contacting the recruiter sometime in the week or so before the interviews, once the schedule has come out. Send an email to the recruiter with your materials and make the case for why you deserve a spot. The second chance you may have is to go to the hospitality suite the day of interviews and, again, ask the recruiter to add you on to the schedule. I have sometimes ended up with half of my summer associate class coming from additions to the schedule. If I felt a student was great, I would ask my interviewer to stay late or even cut into their lunch break. It’s key that you’re prepared with copies of both your resume and transcript (if a student doesn’t submit a transcript, it will make a recruiter assume you are hiding your grades, so do not run out of copies!). Also, make sure you are polite and friendly to everyone in the suite and spend some time there, ask questions, get to know them. Big law may seem very far away when you are just starting law school, but, if it is something you want, there are many firms out there, and they are looking for law students who will eventually become associates and even partners. While you do need some basic credentials to get in the door, recruiters are looking for more than that, and if you are able to show why you would be a good fit for the firm, you may just get that dream summer associate job!